We’ve been really good about studying since we got accepted to Pecs. I’ve spent at least 2 hours a day studying Biology, though I haven’t come nearly as far in my book as I would have expected. I find it pretty easy to study at home – with the right music of course – but we like to change it up by going to a café or the library. We really need to evaluate our use of money before we move and save every cent possible. This means coffee at home and studying at the library for free. A cup of coffee adds up to a lot at 33 kr a day (about $5.75 at current exchange rates). From what we’ve read in blogs by students living in Budapest now, that money could buy you a full meal. I’ve changed up my lifestyle quite a bit. I find myself growing increasingly nervous about being able to study as much as we will need to once school starts. It is easy for the brain to relax when you have been out of school for a while. I’ve deleted any movies or series that I follow, or was planning to watch. This may sound small, but over the past several months I have used up a lot of time following shows. Granted, most of the time I was doing cardio, but even 45 min here and there adds up. I understand that I won’t be able to study EVERY waking moment and that I need to have some leisure time to settle my mind. Budapeststudent.com has been an amazing source of information and he has a list of books that he recommends for medical students. My first choice from the list is Complications: A Surgeon’s Notes on an Imperfect Science by Atul Gawande. It’s an amazing read so far and honestly something that I could consider reading once again during med school and again during my first year of surgical residency. I’m a bit of a stress ball – the kind of person that feels guilty for sleeping in or watching a movie when there is so much to be done. When spending my leisure time reading a book that pertains to my desired field of study, I feel no guilt for the time spent doing so. Instead I feel like I am both relaxing and working on my future at the same time. Oslo was beautiful today. Spring has finally arrived! I jumped into Complications as soon as I got up. The sun was beaming through the windows in our kitchen so I pulled up a chair and sat in the sunlight with my book and cup of coffee. We headed to the library around 12 and studied until 16. Right now I am reviewing basic chemistry and I find it so hard to pay attention. I remember almost everything from when I studied it in the states just not always in the right context. In the end I just need to remind myself that everything counts. 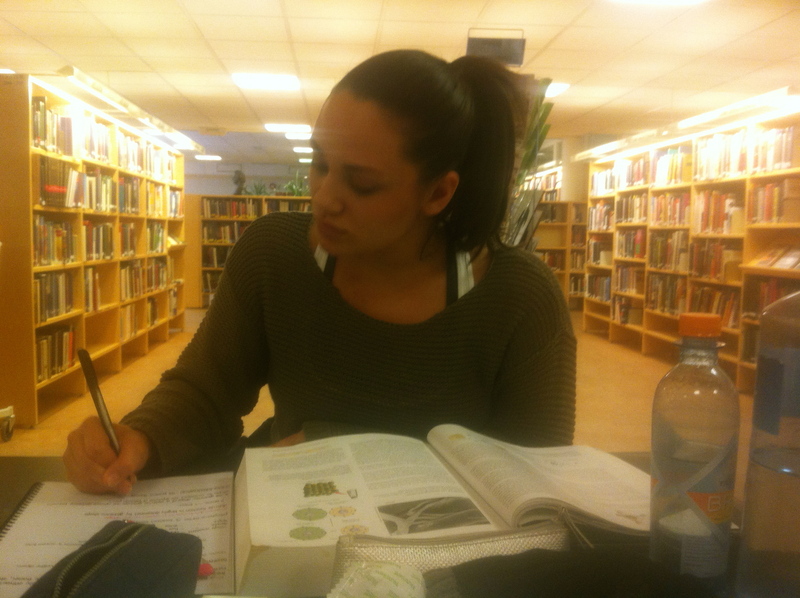 We snapped some pictures while we were studying. This is what we will look like for the next 6 or so years! 35 pages down, 1000 to go! 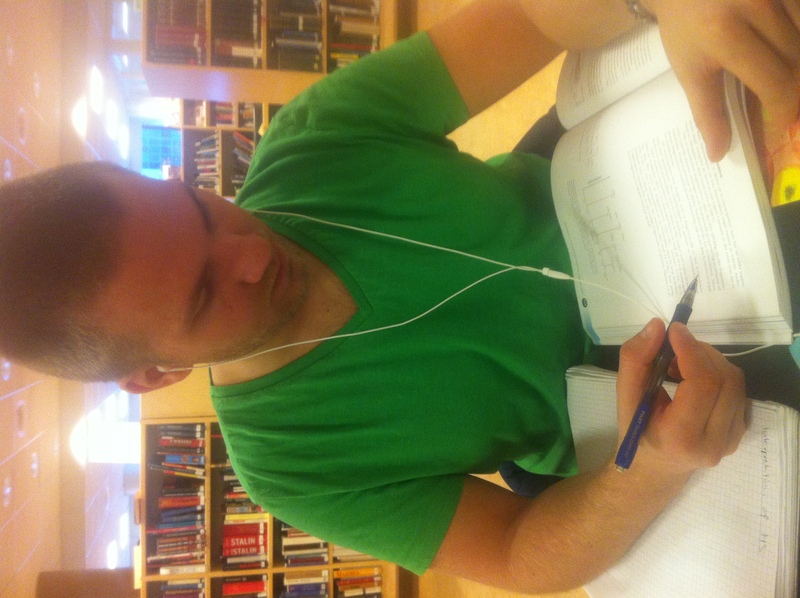 You are currently reading Studying and Lifestyle Changes at Buda-B.